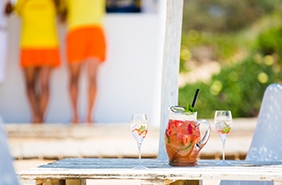 Both the Restaurant and beach at Maria’s are ideally situated and reachable by a fully tarmacked road with car parking spaces right in front of the restaurant and beach. The sand is a simple stroll across a flat wooden pathway (suitable for wheelchair access and ideal for families with young children). 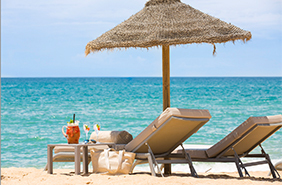 Unlike most other beaches in the area, the owners also control and manage the beach concession and offer sunbeds and shades for your comfort (prices vary). Official months for opening are from 1st May to end October however we will open earlier and close later if the weather permits. Maria’s beach hut serves ice creams, crisps, snacks, coffee and soft drinks. Alcoholic beverages can be ordered here and will be delivered direct to your sunbed or you can enjoy them in our shaded chill-out area. Toilets are found at the back of the restaurant (including Disabled toilet and baby changing table). New shower facilities have been installed outside the restaurant for anyone to use and are ideal for washing little ones or cleaning your feet before you enter the restaurant. Lifeguards work on our beach and a coloured flag will alert you to the safety of the sea (yellow, green, red flags). During the summer season we also have an “SOS”/First Aid room where a nurse is always available. 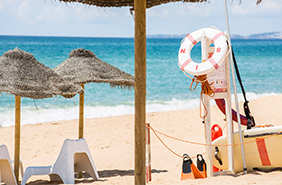 Maria’s beach area is known as Praia Do Garrão Poente (West) and is one of the best beaches in the Algarve as it is consistently awarded with Blue Flag status. Beaches are awarded the Blue Flag based on compliance with 33 criteria covering Environmental Education and Information, Water Quality, Environmental Management and Safety and Services. The local area is “Parque Natural da Ria Formosa” a heritage protected area of lagoons and wet areas that support the local wildlife population. You will find miles of golden sand dunes and this is why rules for building on the beach are so strict, to respect and maintain our beautiful, natural surroundings.